G.M. Roth is ready to help make your kitchen dreams come true. We offer complete kitchen design and remodeling services that can transform your drab kitchen into a sparkling and functional new space. You’ll be eager to welcome family and guests for a gourmet dining experience in your new G.M. Roth kitchen! 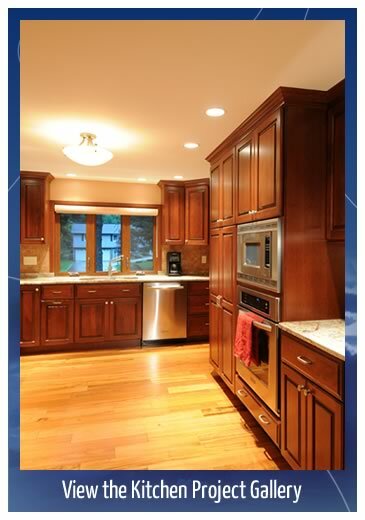 Unlike many New Hampshire and Massachusetts kitchen contractors, the G.M. Roth kitchen design team will spend time with you to learn all about the hopes and dreams you have for your kitchen. We can create the kitchen of your dreams, with all the features, design elements, and functionality you require. Our designers are knowledgeable regarding the latest kitchen trends, from materials and colors, to the newest appliances and lighting options. We can turn our creativity loose on your behalf, developing a design that is sure to impress. The famous TV kitchen designers have nothing on our team when it comes to using space creatively to deliver a dream kitchen for your home. Or, if your home décor and tastes are more traditional, we can create a kitchen filled with old world charm and rustic sensibility. Yet your new kitchen will still provide modern amenities and functionality. Choosing the right materials for flooring, walls and counters can create a traditional look that masks modern convenience. Above all, we want you to be involved and engaged throughout the process of designing and building your dream kitchen. Your input and approval is welcome at all times in order to ensure we create the kitchen of your imagination. Start the process with a visit to our showroom to see some examples of the dynamic, attractive and beautifully functional kitchen spaces we have created. You’ll get some great new ideas, and we’ll be able to begin the process of creating your dream kitchen. Let’s get started on a dream kitchen for your home! Let our team help you deliver on the dream you have for your new kitchen. Call G.M. Roth Design/Remodeling today at (603) 880-3761 or use our convenient on-line request form to schedule a complimentary in-home consultation with one of our talented designers.